Enjoy the benefits of a family-oriented vacation spot with many amenities and a convenient location close the the Pines Village in this bright, open and spacious lakeview home in the Willow Cove area of Bass Lake. This 4-bedroom 2-bath home features a kitchen and living room with an open floor plan. 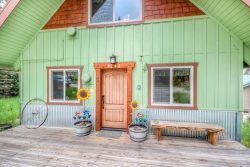 Amenities include WiFi, Central air and heating, fireplace, satellite TV, VCR, DVD, dishwasher, microwave, washer & dryer, deck, hot tub, and a gas BBQ. There is a boat slip available on the Pines Marina. Maximum parking is 4 vehicles; no boats or trailers are to be taken on to the property. A long-term tenant resides in the downstairs apartment. Bass Lake offers you boating, hiking, fishing, and bicycling. The home is near the Pines Village area at Bass Lake, which provides restaurants, a general market, bars, shops, and a full-service marina with rentals for boats, jet skis, and other watercraft. The town of Oakhurst is about 7 miles away, with shopping, restaurants, wine bars, a brew pub, a movie theater, and a live stage theater. The Chukchansi Casino in Coarsegold is 18 miles away. Bass Lake is less than 15 miles to the southern entrance of Yosemite National Park.